A view of the New York City skyline from the Hudson River in 2009. 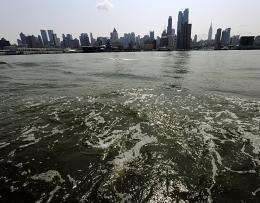 General Electric said Thursday it will soon complete a 500-million-dollar toxic waste cleanup project in New York's Hudson river to settle a decades-old battle with US environmental authorities. It said it had set aside 500 million dollars for the project and that it "expects this step will resolve future uncertainty regarding Hudson dredging liabilities." The battle goes back to the late 1970s, when US authorities banned a carcinogenic chemical -- polychlorinated biphenyls -- which was used extensively in a GE plant along the Hudson. The chemical contaminated a 200-mile stretch of the river, but GE and the EPA argued over the extent of the cleanup and GE's responsibility. "GE has consistently said it wanted to complete the dredging and now looks forward to doing so under terms that achieve the scientific objectives of dredging in a practical and cost-effective way," Ann Klee, vice president of GE's environmental programs, said in a statement. What a joke. The PCB contamination exists at several sites along the Hudson, and is not limited to just the riverbed, but also consists of several plumes of considerable extent that seeped into the local shale formation that underlies the sites where the PCBS were used and/or "disposed" of. 500 million USD is merely a drop in the bucket compared to what a full cleanup would cost, and in no way will bring about the return of the area to anything like a safe environment for human or animal life, which will be threatened oncoing by the continued presence of this poison in the area.